Ladies & Girls Racerback Moisture Wicking Tank Athletic Sports Top. 3 Styles: B-Core, Tonal Blend, Reversible Jersey Moisture Wicking Performance Fabric. 100% Poly Moisture Management / Antimicrobial Performance Fabric. Racerback Tank for Training, Working Out/Exercising and Casual Wear. Worn by female athletes in all Sports from Softball, Soccer, Lacrosse, Indoor/Outdoor Volleyball, Track & Field, Basketball, etc. Ladies & Girls Racerback Moisture Wicking Tank Athletic Sports Top. 3 Styles: B-Core, Tonal Blend, Reversible Jersey Moisture Wicking Performance Fabric. 100% Poly Moisture Management / Antimicrobial Performance Fabric. 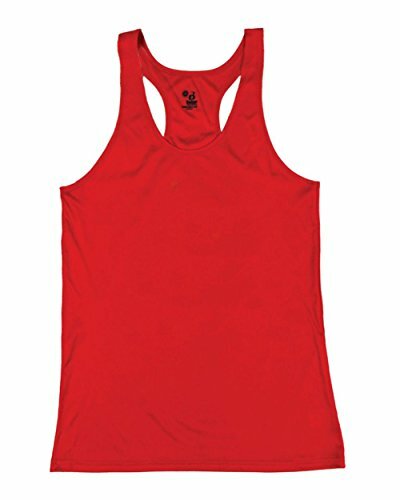 Racerback Athletic Sports Tank Tops Worn for Training, Working Out/Exercising and Casual Wear. Worn by female athletes in all Sports from Softball, Soccer, Lacrosse, Indoor/Outdoor Volleyball, Track & Field, Basketball, etc. If you have any questions about this product by Badger Sport, contact us by completing and submitting the form below. If you are looking for a specif part number, please include it with your message.